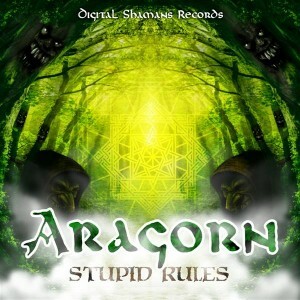 Digital Shamans Records presents Stupid Rules, the debut release by Swiss producer Aragorn. Here we find ourselves deep in the forest groove with twisted atmospheres and high-energy night-time psychedelic trance beats. Fasten your seat belts, it’s going to be a bumpy ride! Mastered at Wild Mastering by E.V.P. with artwork by Superhero Studios. MP3 Download | FLAC Download | WAV Download · Download count: 8,222. Ouuuch! Thanx a lot, guys!!! Great album! Very Very good tracks !! awesome release!! keep up the good work! Very Nice Ideas, arrangement and synth worx. Need improvement on mixixng, imaging and mastering. Lots of mud, and clashes. Thx to everybody for your support and your comments! I like the sounds, but confused by annoying sampling in track 1. How do you think people on psychedelics would react to this random comment about suicide in otherwise upbeat, danceable full on song? Seems pointless to me. @Kamy, yeah there’s some messy audio stuff on this album (particularly the ugly distorted intro of track 3), but I like the bass sound and overall vibe. 4/5 overall, “Non Pas!” may make it into a set of mine. personally I find these kinds of samples distracting in general, it doesn’t just apply to the music of Aragorn. That’s entirely the point. Here are the reasons. 1. Forest has no rules in that regard it’s meant to be strange. It’s keyword could be ‘unsettling.’ Anything that builds that atmosphere is good. The name of this album is Stupid Rules and show’s what Aragorn would think of you suggesting such a sample shouldn’t be in a dance track. 2. Psychedelics have a light side and a dark side. For every blissful feeling on the drug there is a frightening moment that sends a shiver down your spine. This sample is meant to give you that transitory fear, that fear of otherness which is truly psychedelic. Again this comes down to unsettling. Psychedelics are unsettling and so is the sample. You are listening to the wrong subgenre if you want a fully positive atmosphere.